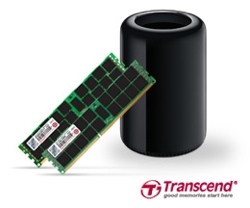 Transcend has introduced new RAM updates for the 2013 Mac Pro, allowing users to bring the total amount of memory in their machines to 128 GB, double Apple and OWC's maximum 64 GBs of RAM. Transcend's DDR3 RDIMMs are available in 16 and 32 GB modules to boost Apple's 2013 Mac Pro machines to 64, 96, or 128 GB of memory, but its 1333 Mhz 32 GB modules run more slowly than the 16 GB 1866 Mhz memory modules it offers, along with those from OWC and Apple. "The new Mac Pro 2013 is advertised to support up to 64GB of memory, and we understand that pro users running applications that place high demands on RAM have a need to meet and most likely exceed this threshold," said Angus Wu, Director of Research and Development at Transcend. "For this reason, we have developed and fully tested higher density modules to give users the option of raising their Mac Pro system memory to the advertised 64GB right up to 128GB." According to the company, the memory modules are easy to install, guaranteed to work with the Mac Pro, and come equipped with a Limited Lifetime Warranty. Pricing has yet to be announced. Update 3/17 9:50 PT: Transcend has released pricing for its RAM upgrades, with the 64 GB kit priced at $980 and the 128 GB kit priced at $2480. Wow. 128 GB RAM makes me wish I had a profession that lets me make use of that much memory. While 128GB sounds like a lot you have to remember that the new Xeons supports up to 768GB. The Mac pro only having 4 ram slots is rather limiting. Well, that's a lot of RAM. Tsk tsk, you young whippersnappers had it easy. My first computer had 16k of RAM. Makes the 1 GB in the iphone seem just a tad too small. It's seriously scary how fast technology is moving nowadays, go back 5 years and talk about a computer with 128gb of ram and people would tell you you're chatting rubbish. Only 30 years ago the maximum RAM you could get was 128KB. I'm guessing in 30 years time we'll see 128TB RAM.